Just saw the cute tiny house on I-25 in Denver, CO! Cheers! Ha, ha, busted. Darn, I thought I was going to slide into Colorado Springs sort of incognito and hang in a secret location while I hiked, dined and danced in the mountains! 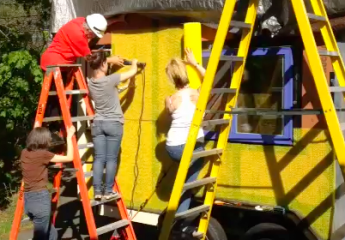 Are you attending the Tiny House Jamboree? I’m giving a workshop there. It will be at the USAF Academy grounds, August 5-7th. If you come, please stop by my TerraBluTeams/SilverBulletTinyHouse booth and say hi!